"US president may have family tie to Strongbow", Liam Reid, Irish Times, 26 Jan 2005. "Scion of traitors and warlords: why Bush is coy about his Irish links" (or via here), Angelique Chrisafis, The Guardian, 27 Jan 2005. It is a new discovery that Bush descends from Strongbow. Strongbow was Bush's only famous ancestor. Only Bush descended from Strongbow. This may be news to the artists of the Ros Tapestry, but it had been known by genealogists for years, certainly since 1994. For example, a sketch by me of the descent has been online since about 1996. Here it is online in Jan 2000 for example. It is trivial to see that this leads to Strongbow. Strongbow is not Bush's only famous ancestor. Bush provably descends from, among others: Strongbow, Aoife, Dermot Mac Murrough, Brian Boru, Charlemagne, Edward III, Edward II, Edward I, King John; Duncan I, King of Scotland; Malcolm III Canmore, King of Scotland; Alfonso VI, King of Leon and Castile; Hugh Capet, King of France; William the Conqueror, Edmund II (Ironside), Ethelred the Unready, Alfred the Great, Lady Godiva; Cerdic, first King of the West Saxons, and many other medieval Irish notables. There seems no particular reason to pick Strongbow as the one to highlight. Going the other way, Bush is not Strongbow's only famous descendant. Strongbow is the ancestor of millions of living people. It is certain that almost everyone in Ireland, and much of the West, descends from Strongbow. Strongbow is provably the ancestor of, among others: George W. Bush, Franklin D. Roosevelt, Winston Churchill, the Duke of Wellington, George Washington, Thomas Jefferson, Charles Darwin, Bertrand Russell, Richard Dawkins, Robert Emmet, Terence O'Neill, William of Orange, Lord Edward Fitzgerald, Marie Antoinette, Tsar Nicholas II, Kaiser William II, the current English Royal family, and even my own children. There seems no particular reason to highlight the link from Strongbow to Bush. Almost everything in these articles is wrong or misleading, from the absurd discussion of a "conquering" gene (Bush probably has none of Strongbow's genes - and anyway, of his millions of ancestors, why pick Strongbow to highlight? ), to the idea that either Bush's Irish ancestry or his English noble ancestry is new (both have been known since at least 1994), to the equally absurd discussion of whether Bush could claim the kingship of Leinster (tens of millions descend from Dermot Mac Murrough - why pick Bush to highlight?). The papers enjoy attacking Bush for being descended from the "villains" Strongbow and Dermot Mac Murrough, but are oblivious to the fact that this is something he shares with millions of other people. Many other US presidents descend from Strongbow and Dermot Mac Murrough. It has been known for many years that George W. Bush descends from Strongbow (Home News, Jan 26). The descent you illustrate, for example, is shown in the presidential genealogy by Otto-Georg Richter in 1994. See my website, "Royal Descents of famous people", for the full reference. Nor is this kind of thing unique to Bush. Through Isabel de Clare, Strongbow is the provable ancestor of millions of people worldwide, including Franklin D. Roosevelt, Winston Churchill, the Duke of Wellington, Charles Darwin, Bertrand Russell, Richard Dawkins, Robert Emmet, Terence O'Neill, William of Orange, Lord Edward Fitzgerald, Marie Antoinette, Tsar Nicholas II, Kaiser William II, the current English Royal family, and even my own children. Full references at the website above. Hence all of the above people descend from Dermot Mac Murrough, and he in turn descends from Brian Boru. 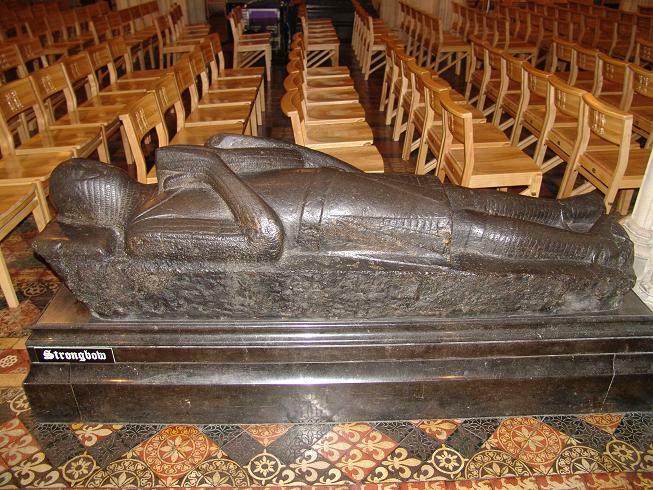 Strongbow also descends from Charlemagne. Yes, history is stranger than fiction. For some discussion, see "Common ancestors of all humans". The descent of Bush from Strongbow may be news to the artists working on the Ros Tapestry, but it has been well known among genealogists for years, certainly since the work of Otto-Georg Richter in 1994. A sketch by me of this descent has been online since around 1996. So this is not actually news. There is no particular reason to highlight Strongbow among Bush's ancestors. Bush descends from many famous people, including: Strongbow, Aoife, Dermot Mac Murrough, Brian Boru, Charlemagne, Edward I, King John; Malcolm III, King of Scotland; Hugh Capet, King of France; William the Conqueror, Edmund II Ironside, Alfred the Great, Lady Godiva, and Cerdic, first King of the Saxons. Going the other way, there is no particular reason to highlight Bush among Strongbow's descendants. Strongbow is the ancestor of, among others: George W. Bush, Franklin D. Roosevelt, Winston Churchill, The Duke of Wellington, George Washington, Thomas Jefferson, Charles Darwin, Bertrand Russell, Richard Dawkins, Robert Emmet, Terence O'Neill, William of Orange, Lord Edward Fitzgerald, Marie Antoinette, Tsar Nicholas II, Kaiser William II, and the entire British Royal family. All these people descend from Dermot Mac Murrough as well. Bush does descend from Strongbow, but the fact is this is something he shares with millions of other people. In fact, the first ever computer simulation of the genealogy of Ireland (carried out last year by my MSc students here at DCU) indicates that, probably, the vast majority (over 90 percent) of the population of Ireland descends from Strongbow. You, gentle reader, are probably a direct descendant of Strongbow, Aoife, Dermot Mac Murrough and Brian Boru. They published this letter (slightly edited) on 1 Feb 2005. I since found that Bush has a descent from Edward III. There is no particular reason to highlight Strongbow among Bush's ancestors. Bush descends from many other famous people, including: Strongbow, Aoife, Dermot Mac Murrough, Brian Boru, Charlemagne, Edward I, King John; Malcolm III, King of Scotland; Hugh Capet, King of France; William the Conqueror, Edmund II Ironside, Alfred the Great, Lady Godiva, and Cerdic, first King of the Saxons. Going the other way, there is no particular reason to highlight Bush among Strongbow's descendants. Strongbow is the ancestor of, among others: George W. Bush, Franklin D. Roosevelt, Winston Churchill, The Duke of Wellington, George Washington, Thomas Jefferson, Charles Darwin, Bertrand Russell, Richard Dawkins, William of Orange, Marie Antoinette, Tsar Nicholas II, Kaiser William II, and the entire Royal family. All these people descend from the "traitor" Dermot Mac Murrough as well. I hope it is clear, therefore, why discussion of a "conquering" gene makes no sense (Bush probably has inherited not a drop of Strongbow's DNA), and neither does discussion of whether Bush could claim the kingship of Leinster (tens of millions could claim the same). I realise that it sounded like a good story to draw parallels between Bush the invader and Strongbow the invader, but - while it is true that Bush does descend from Strongbow - so do millions of others across Britain, Ireland and the world, including almost certainly most of the readers of this letter. They did not publish this letter. Shame on the Guardian. They published an article of genealogical and genetic nonsense, written by people who are not expert on the topic. An expert in the topic writes to them to correct the article, and they do not publish it. The genealogical and genetic nonsense stands uncorrected. While the Guardian fails to print any correction, the corrections are available in full online. Scott Burgess spotted straight away that there was something wrong with this story: "Or maybe it wasn't "historians" at all, but "an artist working on a tapestry to commemorate Ireland's Norman heritage"." Jim Miller smells something fishy straight away: "That this is nuts should be obvious to any reasonable person. That it is published in one of the most influential leftist newspapers in the world illustrates, once more, how intellectually bankrupt much of the left is. Does Ms. Chrisafis have any idea just how many ancestors all of us have if we go back to 800 AD?" And he then finds my website about MRCAs.